Now that the Samsung Galaxy S5 features a water-resistant design, it eliminates the need to pick up those waterproof cases that would normally bulk up its size tremendously. Therefore, many owners of the beloved smartphone are more inclined to pick up a generic protective case instead. Generally speaking, the majority of them provide protection around the rear and sides of the phone – leaving the display exposed to the harsh elements. 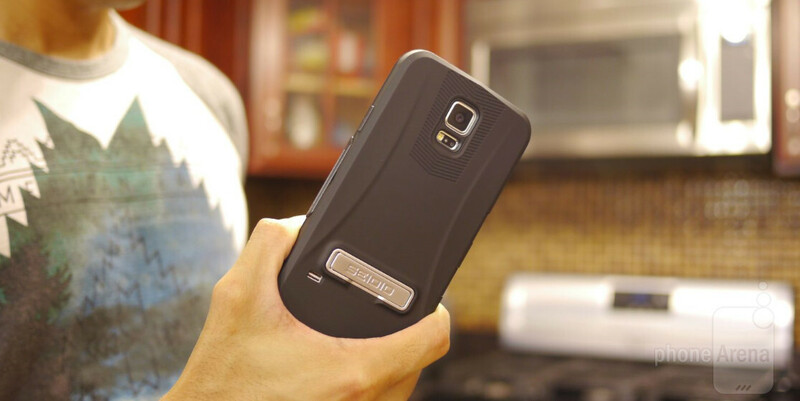 Well, the Seidio CAPSA TouchView case for the Samsung Galaxy S5 ensures you get all-encompassing protection, as it features an integrated screen protector meant to shield the display from scratches, bumps, and drops. Frankly, it’s far from being stylish or fashionable with its design, so don’t expect to wow people as you whip it out of your pockets. Seidio has opted to get with a conventional case design, one that donning a soft-touch finish that’s resilient to smudges and fingerprints – while giving it a good grippy feel in the hand. Comprised out of three main components: an interior rubbery feeling TPU cushioning skin, a sturdier plastic frame, and the detachable 0.5mm 5H rated screen protector. Inserting and removing the Galaxy S5 is a simple process, which is done by simply prying it off slowly around its side. Speaking of its sides, they’re well-protected and covered – though, we appreciate the wider cut to the 3.5mm headset jack. Heck, there are also cutouts for the fingerprint and heart rate sensors, but with the former, it seems as though we need to swipe down at a slower pace for the fingerprint sensor to register. In terms of protection, the CAPSA TouchView case is pretty darn good at absorbing shock due to minor falls, which is attributed to the case’s MIL-STD-810G certification and Hexguard technology. What’s that you say? Well, it’s the honeycomb pattern of the interior TPU case that aids in the process of absorbing shocks. Whereas other traditional cases leave the display exposed, the integrated screen protector of the case safely guards it. However, we do notice that its sensitivity is lowered, but it can be remedied by enabling the smartphone’s “increase touch sensitivity” mode. As an added benefit, the CAPSA TouchView case also packs Seidio’s signature kickstand – a common item we see from its line of cases. More than strong to prop up the phone in landscape, it presents us with the option of having a hands-free experience, whether it’s watching a movie or playing a quick puzzle game. There are two options to go with the CAPSA TouchView case: $39.95 for the case by itself, or $49.95 for a combo that includes a rotating holster with removable clip. Considering that most semi-rugged cases for the Galaxy S5 can easily retail over $30, we find its pricing to be sufficient seeing that it also serves to protect the screen as well. They have the Waterproof version (OBEX) for the Note 3.
could anybody explain to me, why spigen.com shows photos (of cases) including upcoming iphone 6? do they know how it would look like? or is it just render or sth? It's a render. They get info from the company as they have to manufacture them before the smartphones hit the market. They get the size specifications, shape, and camera cut-out plus button and slot placements. I've never liked a protective case, because usually it makes my phone becomes bulky and uncomfortable to use. For protection i prefer using vertical pouch, wrist strap and tempered glass / Durable film screen protector. I don't know if anyone imagined how awesome the S5 would look if you just look at the phone from inside the cover's view. Absolutely no bezels at the sides and really small bezels from up and down.